The beginning of the 2009-10 college football season is still over a month away and there are still 168 days between now and the BCS National Championship Game. But that doesn’t stop a degenerate like myself from pulling out the crystal ball and some national championship odds and trying to project which school will overcome challengers, fluke bounces, terrible calls, injuries, suspensions and cash this year’s championship futures bet. Therefore I offer my college football National Championship predictions. This year the national championship will be played on Jan. 7 at the Rose Bowl in Pasadena. The absolute first thing you have to consider when you are making college football National Championship predictions is whether or not the team you have your eye on can even make it there. The idea isn’t just to pick the team that you think is going to win the title. Because if you can locate a team with good odds that can get to the Rose Bowl then you can put yourself in the enviable position of having a shot at a guaranteed profit. For example, everyone knows that the Florida Gators are the favorite to win this year’s trophy. They are the best bet to get to the Rose Bowl so they have to be the best bet to win it. But if you get some cash down on a team like Virginia Tech (20-to-1) or Penn State (30-to-1) and those teams actually make it to Pasadena then you are golden. Then you can place a significant money line wager on the Gators and put yourself in a position to win money no matter which team wins. The second thing that you need to look at when you’re thinking about college football BCS odds is which teams can’t win the championship. By eliminating teams with inflated odds you can narrow the field and thus increase the chances of landing the right choice to land the hardware. Florida (2-to-1) – I just don’t know how much of an explanation this one needs. The defending National Champions are led by one of the top quarterbacks in college football history, the best coach in the sport, all 11 starters from a devastating defense, and they have a manageable schedule. It’s very difficult to repeat a national title but barring an unforeseen rash of injuries, suspension, or locusts in Gainesville I don’t see how the Gators don’t at least find their way into the SEC Championship Game. And when they make it to that point do you think you’ll get 2-to-1 on them to beat either Ole Miss, ‘Bama, or LSU and then win the crown over some soft Big 12 team? I don’t either. Texas (5.5-to-1) – Oklahoma is actually the preseason favorite to come out of the Big 12 but I think that this league is Texas’ to lose. The Longhorns beat the Sooners straight up last year, brought back more returning starters, has an easier schedule, and will have the sympathy of voters late in the year because of last season’s snub. I don’t think that the Longhorns are good enough to beat the Gators if they face them straight up. But one of the main things in determining a futures bet is whether or not the team can get to the title game. If you make this play and Texas does hit the BCS title game then you’d probably be looking at a great hedging opportunity. Ohio State (12-to-1) – I just don’t see any way that the Buckeyes could possibly make it to the title game. Their humiliating national title performances are still fresh in voters’ minds and if OSU gets hammered by USC the second week of the season their chances go from about two percent to zero percent. Way too much has to go right just for OSU to get to Pasadena. And then they’d likely have to beat Florida. Seriously. USC (6-to-1) – Last year the Trojans had one of the top defenses in the country and were playing in a watered down, in-transition Pac-10. They had a quarterback good enough to be a first round pick and a load of experienced wide receivers. But much like Ohio State, the Trojans just lost too much talent to the draft. Further, USC would have to win at The Horseshoe and at Berkley against quality teams in the first month of the season while breaking in a new quarterback, offensive coordinator, and defense. These odds should be double. Notre Dame (30-to-1) – Again, is this a joke? I understand that the Irish will have a decent little squad this year. Only having four road games is a big plus as well. And I know that they are America’s Sweethearts so they’ll get their knob bobbed by voters. But I don’t see Notre Dame making it through the fire with less than two losses. And I think it’s obvious enough to anyone that they would get absolutely maimed by any of the top SEC or Big 12 teams. 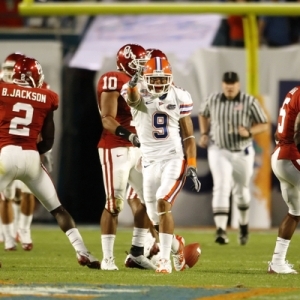 Seriously, what would Oklahoma or Florida do to Notre Dame on a neutral field? LSU (20-to-1) – Once again, the first thing you have to consider when placing a futures bet is whether or not the team can make it to The Big Game. In order to do that the Tigers would first have to win the SEC West. Since they have to go on the road to face three of the best four teams in the SEC – Georgia and West rivals Ole Miss and Alabama – as well as hosting Florida I think that’s a longshot. And even if this Tigers team did make the SEC Championship Game they’d have to beat the Gators again. And then that’s just to get to the Rose Bowl. Tall, tall order. Virginia Tech (20-to-1) – The ACC is absolutely no joke this season and Tech is considered the favorite. So if Oklahoma State can muck up the works in the Big 12 or if Florida gets upset in the SEC then a spot could open up for the Hokies to slide into at Pasadena. The Hokies have the national credibility that really restricts some less recognizable programs and looking at their schedule an 11-1 regular season is really not a reach. Tech made a BCS bowl game last year in what was an obvious rebuilding season. Now with plenty of depth and experience they are a great sleeper at this price. Mississippi (25-to-1) – The Rebels really have the inside track in the SEC West. And if they can outlast Alabama and LSU – both of which come to Oxford this year – then that will set them up man-to-man with the Gators in Atlanta. Ole Miss isn’t scared of the Gators. They are one of just five teams to have beaten Florida in the last three seasons, winning in The Swamp last year after a six-point near-miss at home in 2007. If they beat the Gators in the SEC title game they’d have a shot at the Big Prize. California (35-to-1) – Cal is in a situation similar to Virginia Tech. They are clearly in the second tier behind the top four of five teams in the country. But if they catch a few breaks they could be playing close to home for the BCS title. I still think that the Pac-10 is way down this year and the Golden Bears are the second-best team in it. But they get USC early and they get them in Berkley. If they win that game and avoid more than one upset loss – and get some help in the SEC and Big 12 – then Cal could get the nod. Georgia Tech (50-to-1) – If you look at what the Yellowjackets did last year in Paul Johnson’s first season, look at the 18 starters that they return, and look at the opportunity that they have with their schedule then the Jackets could be a worth a $10 or $20 bet with a solid return potential. Their schedule is absolutely brutal. They are at Miami, at Florida State, have two road games against SEC teams, and then home games with Top 25 teams Clemson, North Carolina, Virginia Tech and Georgia. That’s absurd. But if they come out of that with just two losses, win the ACC title, and get some help, who is to say that they couldn’t head West with some fat odds.